What is the first thing you usually notice about a freediver? Their fins. They are long, they are elegant, and the way they bend when a freediver is finning is almost hypnotic. But there is a technical reason why freedivers choose freediving fins instead of scuba fins. We move through the water by displacing it, and since freediving fins have a larger surface area, they displace more water, offering more power. The blade of freediving fins “snap” while finning, giving the diver a second burst of power, which makes them more efficient for freediving. But when it comes to buying freediving fins, the number of choices can be overwhelming. 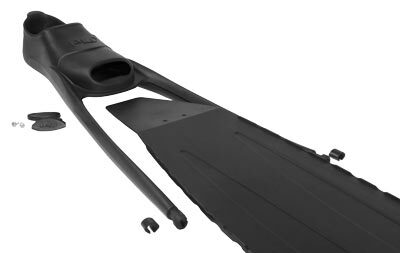 Here is a guide that can help you understand the different components that makeup freediving bi-fins. Foot pockets can be integrated with the blade, or separate. 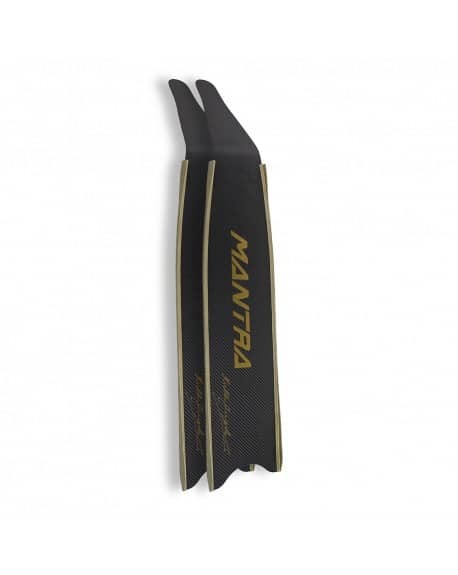 Separate blades and foot pockets are usually either fastened together with one or two screws and clips on the side rails, which can come in handy when you want to travel and take your fins with you. Others have to be glued to the blades, which means that they have a limited amount of times to switch blades. If a blade breaks and needs replacement, or if you just want to upgrade the blades at a later date, having separate foot pockets and blades can be very useful. 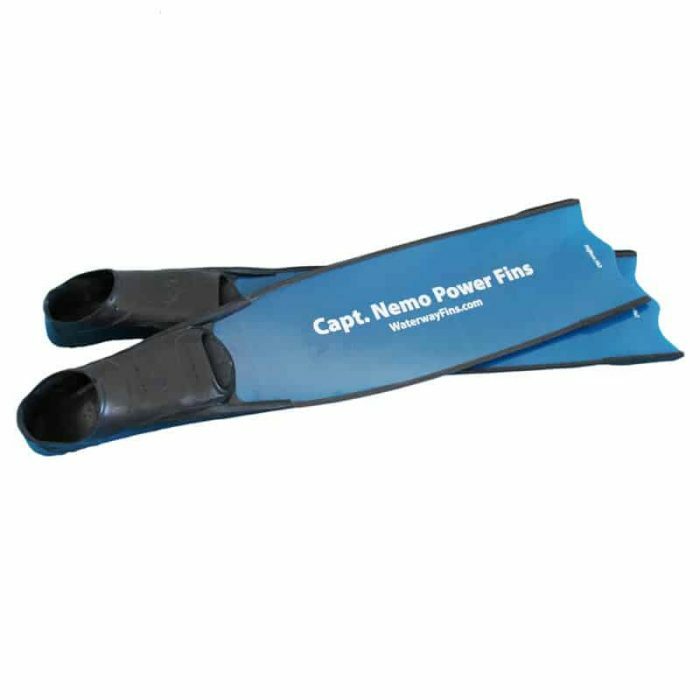 A couple of downsides to separate foot pockets is that some types may add a noticeable amount of weight, or decrease the efficiency of energy transfer if they are fastened with screws and clips. Make sure to take a look at the thickness of the rails (also called the tendons) as well, since noticeably thicker rails will make even the softest blades more rigid, and rails that are too soft will not adequately support the blade, which can overstress the blade, possibly to the point of breaking. An angled blade makes surface swimming easier than one with no angle, although whether it is more efficient in the water is not yet determined. Comfort is essential, as a person’s technique tends to suffer when they are in pain. Foot pockets need to have a snug fit, but not so snug that they will cause you cramps and numbness in your feet, and should have softer material in contact areas. Not all foot pockets are created equal. Some are known for being wider, narrower, stiffer, softer, etc. You can ask for other freedivers’ opinions or do an internet search, but the most beneficial thing you can do for yourself is to try it on before you buy it, whether it is at a store or a friend’s fins. Sizing is very important, as any unused space that is allowing movement is lost power. Fortunately, socks can help with sizing, but anything bigger than 3mm will cause a loss of power due to the thickness of the neoprene. Socks are very valuable to your foot pockets and your feet. Are your foot pockets rubbing your bare feet raw and leaving you scarred? Freediving socks are the answer. Maybe you will be diving in colder temperatures? Socks will keep you warm. Are there jellyfish and other stinging creatures in the water? Socks will protect your bare ankles and toes. Before deciding on the size of a foot pocket, make sure to note what water temperature you will be diving in, so you can plan which thickness of socks you will need, and then choose the size of the foot pocket accordingly. Fin blades are an investment. They can last you for years depending on how well you take care of them. But how do you know which material is best for your needs? Advantages: Plastic fins are a good option for beginners. 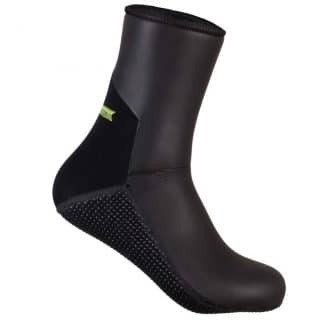 They are the cheap and durable, which is useful early on in your freediving career when you might accidentally drag them across rocks or kick hard structures. Disadvantages: They have less snap, which creates poorer power transfer. They also will start to lose their shape and stiffness after bending so many times. Fewer options for stiffness, and may be too stiff for smaller freedivers down the road. Advantages: More efficient than plastic fins with a better snap, and a better choice for intermediate divers who are going deeper. It also retains its shape and stiffness. Disadvantages: More pricey than plastic fins, and also fragile. Take care when traveling with them and avoid setting other equipment on top of them or accidentally dropping them. 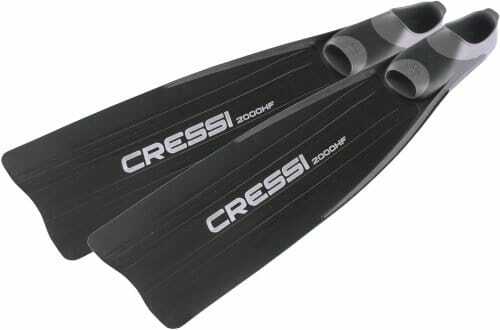 Advantages: Best material for performance, often used by professional freedivers. The best material for deep dives, and also the lightest blades. Very reactive snap. Disadvantages: Most expensive blades, and very fragile. 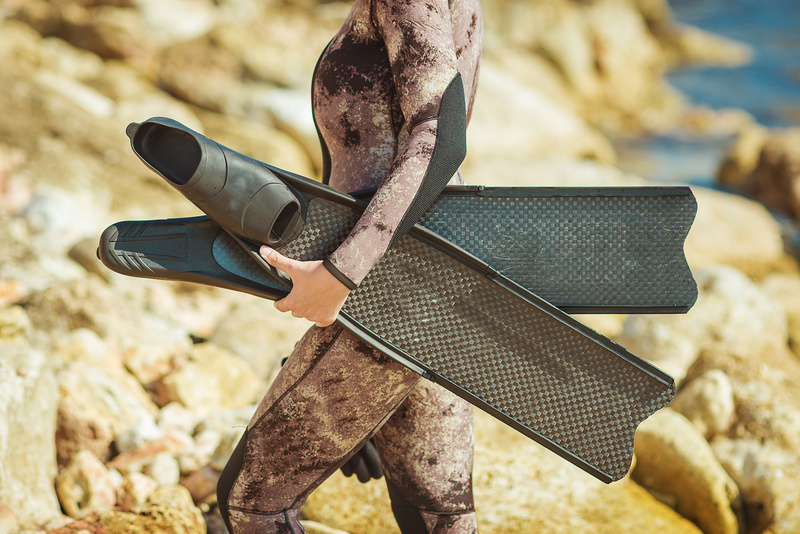 Extra care needs to be taken when packing carbon blades for travel, and you should avoid shallow water with coral reefs and rocky surroundings. You can have the most expensive blades known to mankind, but if the stiffness is not suited to your body and your abilities, your efficiency will suffer. Too soft will give you less power and require extra movement, and too hard will take more of your energy, burn more of your precious oxygen, and can also cause more lactic acid buildup. Many freedivers think you need stiffer blades the deeper you go, but in reality, the stiffness should match your musculature. Soft: For freedivers that are smaller and do not have a lot of leg muscles and power. Medium: For freedivers who are of medium build with a normal amount of leg muscles and power. Hard: For freedivers who have very strong legs and a bigger build. Do not make the mistake of thinking that the most expensive freediving fins will make you a better freediver. Technique is what makes you a better freediver, and investing a large sum of money in fins will not improve your technique. With that being said, just make sure to take into account the temperature of the water you will be diving in to decide the sock thickness, your musculature and leg power for the stiffness, your level of freediving for the blade material, and your budget when searching for freediving fins. Try not to buy fins before having tried them on, at least on land if not in water. And last, but not least, avoid merely copying your friends or professionals, as abilities and bodies vary. Good luck! Nice and short. I would add though, a couple of things: 1) Blades should be as wide as possible. Wide blades induce less induced drag, i.e. provide greater efficiency. 2) The so called ‘angle’ is wrong. I makes the backward move inefficient, forcing the diver to bend his/her knees too much. 3) Rails should be very, very soft and not absorb any energy. Hi Volodya! Thanks for the additional information!